Location. The Suncoast Hotel & Casino in Las Vegas, Nev., rests at the foot of the Spring Mountains, 10 miles from the Vegas Strip. Red Rock Canyon National Recreational Area is six miles away. Hotel Features. This hotel offers scheduled, complimentary shuttles to and from the Strip and the airport. The Suncoast Hotel & Casino’s outdoor pool offers relief from the desert sun, and a spa tub lends an opportunity for relaxing conversation. The 80,000-square-foot casino supplies gaming action, although an alternative is the 64-lane bowling center that features a festival of lasers, lights and music. A 16-screen movie theater provides comfortable loveseats. Guests can enjoy the Suncoast Showroom, which hosts top performers. The hotel features nine restaurants that offer culinary delights from classic Mexican fare to the flavors of the Orient. Guestrooms. 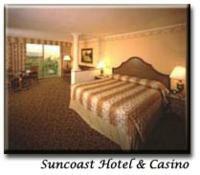 The 10-story Suncoast Hotel & Casino has 440 Mediterranean-style guestrooms, all with high-speed Internet access. Accommodations include separate sitting areas and floor-to-ceiling windows offer views of desert mountains and golf courses and/or The Strip’s glittering neon. Decor features burgundy-and-gold fabrics and Mediterranean prints mounted on the walls. Large bathrooms feature twin sinks with granite vanities. Expert Tip. Spring Mountain Ranch is located within Red Rock Canyon National Recreation Area. Living history programs at the park give visitors an opportunity to view life at the ranch as it was during its prime. The ranch’s Super Summer Theater series runs every June, July and August, and Theater under the Stars features musicals and plays for the whole family. Casino – 80,000 Sq. Ft.